Making Art Podcast No 6: Filmmaker Sue Thomson | Daily Review: Film, stage and music reviews, interviews and more. In this week’s Making Art podcast, actor and writer Neil Pigot talks to documentary filmmaker Sue Thomson, best known for her film about men and ball games Boys and Balls, about what drives her to make films. To listen to the 60 minute podcast, click here and to listen to any of the five previous podcasts click here. Creative Victoria is the state government body dedicated to championing, growing and supporting Victoria’s creative industries. We invest in the ideas, talent, organisations, events and projects that make Victoria a creative state. So go the opening lines of Creative Victoria’s home page and it all sounds very positive and important until you stop and ask that simplest of questions, what does it mean? And the answer is: I am genuinely not sure. What I can be certain of is that those two punchy sentences, those two examples of poor syntax and grandiose superlatives which sound like the opening lines of a business investment prospectus, are borne of an ongoing public conversation about art that reverberates beyond the creation of the work itself. Welcome one and all to the bewildered and bewildering world of public debate surrounding the value of art. And it was this question of value, or at least our understanding of what value means in a cultural context, that was on my mind as I left the home of the Melbourne filmmaker Sue Thomson. Sue makes films, often with little or no money, about the things that interest or concern her. If you have ever seen one of her recent pictures it would come as no surprise that when you meet her you are immediately aware that you are spending time with someone who cares. There are no punchy slogans, no soapbox statements; just a deep, heartfelt humanity of the kind that transcends glib clichés, a care that is an intrinsic part of her being. It’s the way she lives her life and it is as a consequence of this that Sue is one of those remarkably rare artists whose work is not separate from but rather a function of who she is. I confess that I have known Sue for the best part of 20 years. Our children attended the same primary school where I first encountered her in the school canteen. At that time, the mid 90s, she had made her first film, Boys and Balls, an irreverent but deeply human look at men and their obsession with ball sports. To some extent making that first film was all a bit of a fluke. “I’d never made anything and I wrote this script and sent it to the ABC and we were on holiday in the UK and I got this call saying that they wanted to commission it. I was stunned,” she says. Someone once said that art helps us understand the things we think but struggle to say, that it can make sense of a world that lies tantalisingly beyond the reach of our own experience. Boys and Balls was the beginning of a creative journey that I suspect began with a simple curiosity about the world around her. That has been honed over time into a desire to give voice to those that cannot speak, offerings that give us an opportunity to understand those things that we see but cannot connect with. Art creates value not because of the number who attend, but rather through a complex chain of human interactions that give an event meaning. That statement gives a clear illustration of how the terms of the arts value debate were cast, and how over a relatively short period of time this nexus of cultural value and finding a way to describe or quantify it in order to justify government funding has come at a cost. Instead of a rigorous exploration of the complex issues involved in art making and its multi-faceted relationship to a community or society, a rather simplistic discussion has emerged, one which has focused solely on measurable ‘impacts’. And interestingly I had a chat with one of the ‘impacts’ of Sue’s work as I was walking home. 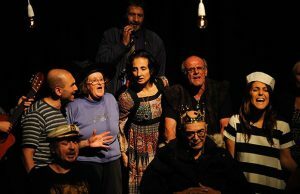 In 2013 Sue made the documentary film Tempest at the Drop In where she followed five theatre professionals and a group of marginalised men and women as they worked to present a production of Shakespeare’s The Tempest at TheatreWorks in the Melbourne bayside suburb of St Kilda. Amongst the cast of social outcasts who frequented the drop in centre in nearby Balaclava were several who suffered from profound mental health issues, a number with co-morbid substance abuse issues and my friend Mark. Mark has lived in relative anonymity in Balaclava for over 20 years. Born with some physical and intellectual disability Mark none the less has his own flat which he shares with his girlfriend. They live quietly in a loving and supportive relationship. Mark sees the experience of making the play as one of the highlights of his life. It offered him an opportunity to connect with an inner sense of value as a human being. People who once shunned him in the street now engage with him as a fellow. This is perhaps all any of us crave. Acceptance and understanding, rather than judgement and pity. And that value cannot be purchased or sold. That particular form of human value can only arise from a lived experience. Culture or art creates value not because of the number who attend, but rather through a complex chain of human interactions that give an event meaning. Something that is inherent in Sue’s practice. What Sue thought she was doing when she approached the project has meaning as an idea. For her it was about the process of hearing people’s stories, really listening and connecting to another life in an intimate way and that has real value. In turn, the rehearsal of the play has a meaning and value as does its performance and the resulting film has yet another meaning, each based in a different experience and connection to the project whether as a participant or viewer. This is the point. So if you are going to talk about the value of a cultural experience you are wasting your time unless you are talking about the meaning that is the product of that experience. And yet our conversations about the value of the arts have come to be dominated by what might best be termed the cult of the measurable and, of course, it is those disciplines primarily concerned with measurement, namely, economics and statistics, which have been looked upon to find the evidence that will finally prove why the arts are so important to individuals and societies. But economics and statistics can only take us so far. They can tell us that the arts produce economic impacts (in Victoria $22.7 billion according to Creative Vic) and they can tell us how great or small these impacts are in relation to other areas of human activity (8% of Victorian GDP). But unless we see economic function as the primary purpose of the arts, then economics can tell us bugger all about their intrinsic value. And while economics might be able to show that the arts might have positive flow on effects and, if they do, this might be a justification for public subsidy what it cannot do is tell us how or what the flow on effects attached to the arts actually do to enrich the lives individuals like Mark and the societies they commune with. Economics cannot measure meaning. Sue struggled to get a release for Tempest at the Drop In. The subject matter wasn’t part of the zeitgeist. Mental health wasn’t ‘the thing.’ Finally in an act of desperation she called the ABC who had previously shunned the film during Mental Health Week in 2014. They purchased Tempest for $7,000. It has now been screened seven times. “I would have sold it for $700”. A kiss is not love, attendance to a cultural event is not understanding, engaging in the making of art is not an economic exchange. Art and culture are what they are because we see meaning in them and that is their value. 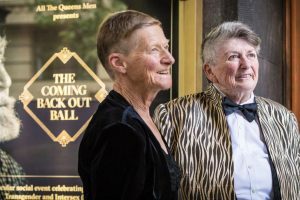 Tempest at the Drop In was a labour of love and care as is Sue’s new film The Coming Back Out Ball Movie which closes this year’s Melbourne International Film Festival. The story of older members of Melbourne’s LGBTIQ who in their senior years are reclaiming their sexuality, The CBOB Movie is again a story of people who live on the fringes of a society where there should be no fringes. A story of people who through no fault of their own have had to endure prejudice, shame and persecution in a society that claims to be tolerant and egalitarian. And that has meaning. And Sue will. Not because there is a measurable impact. Not to contribute to our economic bottom line. But because she has to. And for that I am deeply grateful. PS Thanks, Neil – for your writing! Moving. Simply moving. This is humanity – about our connections as human beings right across the spectrum of our existence and expression. Sue is a Living National Treasure. Can someone please give her an annual grant – make it a movie-making grant (even as little a $100,000 – a top teacher rate – not much at all – to make the films she wants to make – her choice – but guaranteed showing on the ABC – or with cinema release/circuit. How refreshing to read Neil Pigot and his insights into what the arts are really about. Blessed relief from the usual motherhood statements and economic rationalisations.